“Umbrella Brand” is an industry term for an overarching brand used across multiple related products. Giant companies like Heintz, Levi Strauss, and Sony use Umbrella Branding to promote a whole range of products cohesively. For instance, Heintz recently launched a $8.3 million campaign to brand their slogan, “It has to be Heintz” which automatically promotes a whole line of products. Many industry experts say that Umbrella Branding only works when the company has a line of very similar products. However, I have been successfully using the concept of Umbrella Branding when helping my customers create one brand for a variety of seemingly disparate offerings. Many of my clients have developed a range of techniques, products, and resources to solve the variety of challenges their customers face. They are often confused about the best ways to market these offerings cohesively, and find themselves explaining their modalities to a confused audience. Umbrella Branding helps them deliver a cohesive and potent message. Every “Soul Symbol” that I create is an umbrella brand because it’s a brand for my client’s soul purpose, and everything they do in their life is inspired by that purpose. The process I take my clients through is called Branding from the Heart and the result is a brand that represents your purpose and seamlessly promotes everything you offer. When you tap in to your core essence and start using the Branding from the Heart process to create a brand message that is truly from the heart, then you are already half-way there. Then it’s just a matter of expressing that message to people in a way that clearly unifies your offerings. The first step is to ask yourself: What makes me tick? What is at the core of every major step I’ve ever taken in my life? What makes me tick is the desire for freedom for all of humanity along with an intense passion for the beauty and magic of creation, and the passion to express that which makes me tick. That is at the heart of all of my business and personal brands. 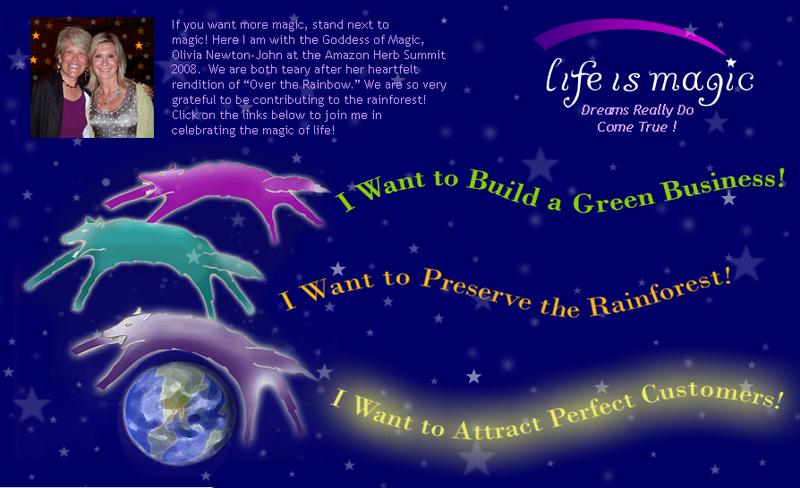 I created my own Umbrella Brand about 12 years ago called Life is Magic. I have a website at that URLhttp://www.lifeismagic.biz/. It’s a bit outdated I’m afraid, but it still works! When I created the name “Life is Magic”, I considered how I have loved everything magical ever since early childhood. I thought about all my offerings, from graphic design to websites, to Law of Attraction consulting, branding, marketing consulting, social networking, and the wildcrafted herbs and juices I love to promote, and how they are all an expression of my love for magic. I even thought about the historical fantasy novel I’m writing which includes much from the shamanic realms. My umbrella brand will even work for that! So Life is Magic is a perfect Umbrella Brand for me. The key to my method of Umbrella Branding is tapping deeply in to your core life purpose. When you clarify your purpose and develop that into a mission statement, you are on the way to creating an Umbrella Brand that will work for your chosen focus, even when it changes, for years to come. Drop deep within your heart to discover what is most important to you and start writing down the words that describe it. Think about how you expressed that when you were a child, a teen, a young adult, and now. see if you can discover the unifying principles from all areas of your life. Write out words that represent the results you offer, and what you stand for in the world. When you creatively combine your passion with your offerings, you will be well on your way to creating your own unique Umbrella Brand. I absolutely LOVE the way that you help me to keep this branding from the heart a focus in my life by writing blogs, sending CAB “homework” emails and overall maintaining a support that is consistent without being overwhelming. With two small children it is a challenge to find “think” time but I find myself looking forward to it each night before bed when I can think about ME and what makes me “tick”. I have a way to go but the journey will prove to be just where I needed to go. Thanks.